In Special Units in the military, you always hear their mantra as, “Train As You Fight”. Among elite runners, their mantra should be “Train As You Race”. In order to have a quick look and observation on the training & preparation of Gerald Sabal and Marcelo Bautista for the 2013 Vibram Hongkong 100K Trail Run in Baguio City, I have to personally see for myself how their training was on-going with regards to their acclimatization to cold weather environment, altitude training, and feedback about their training program & workout. I went up to Baguio City and see the progress of their training. I had a chance to join in one of their daily workouts. On my first day in Baguio City, I treated them to a lunch and it was there that I was able to give my instructions about their schedule of training; suggested running route in the city and its environs; and gave them their running apparel/kits and their nutrition needs, courtesy of Andre Blumberg who brought the items from Hongkong to Manila during his participation in the latest edition of the TD 100 Ultramarathon Race. Gerald and Marcelo were instructed to use the Hammer Perpetuum as their source of nutritional needs during the race in order to minimize spent time in stopping in every Aid Station for their food intake. And they should be used to be taking such food mixture/supplement every time they have their daily workouts until it becomes natural for them during the actual race. I clearly explained to the two runners on how to mix the Hammer Powder with water in their hydration bottles and how the mixture is being consumed during the run. I asked them to run with me all the way to the peak of Mount Santo Tomas on the following day and be able to start using the Hammer mixture as their food intake during the run. We started at 4:00 AM when the temperature in Baguio City was at its coldest at the Marcos Highway & entry to the Green Valley Subdivision. It was still dark and we were able to use our headlights and hand-held flashlight. The two runners were using their respective Salomon S-Lab 5-Liter Hydration Pack where one bottle is full of Hammer Mixture and the other bottle was full of water. As for me, I brought a single bottle of Simple Hydration filled with water and no gels or Power Bars. At sunrise, we were already at the peak of Mt Cabuyao and it was cold and windy. We pushed, jogged and brisk-walked, for another 4 kilometers until we reached the peak of Mount Santo Tomas. Before we reached the peak of Mt Santo Tomas, I felt all my fingers were already numbed and could hardly clench my fist because of the cold temperature. The wind had become stronger, producing a distinct loud sound within the surroundings. Marcelo told me that it is always cold and windy as one approaches the top of Mt Santo Tomas. We end up on the building structures and antennae on the peak of the mountain and we had some picture taking moments. After a few minutes, we started our descent towards Mt Cabuyao but my fingers were still numbed and hard! It was an easy jog in going back to Mt Cabuyao. From Mt Cabuyao, I took some pictures of the two elite runners going down towards Marcos Highway. My run to the peak of Mount Cabuyao and Mount Santo Tomas officially started my next season of “peak bagging” feats. It is a “short” but long 24K run but it took me 4 hours & 20 minutes for the said workout. After the workout, I had another chance to get feedback from my runners. They told me that they like the Hammer Mixture and they did not have any stomach issues. I instructed them to use it every time they have their workout until they taper down before the event. For one of their long runs before tapering, I told them to run the Baguio City-Ambuklao Dam-Baguio City route and be able to use the Hammer Mix during the duration of their run. They were able to follow my instruction and they were able to finish the course in 7+ hours! The feedback was that they liked the Hammer Mix and they did not have any stomach issues. 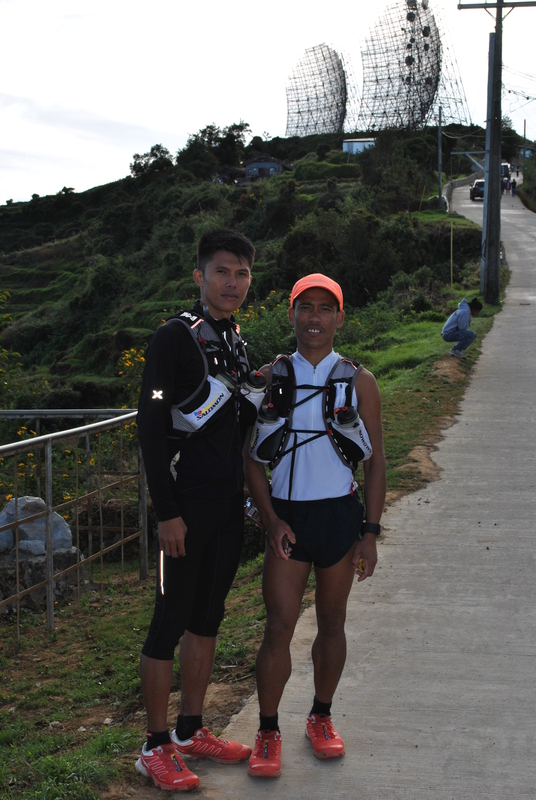 A good teamwork developed between the two runners for the three weeks that they have trained together in Baguio City. The two shared their strengths and weaknesses and I could see that both runners respect each other. Practically, both runners lived together in one place during the duration of their training. I can’t consider myself as their Coach & Manager but I think I am a “facilitator” and a “father-figure” to them with regards to their training and preparation for the “Big Dance” in Hongkong. Sometimes, I would still act as a Military Commander & General to them just to stress and give importance to what I am telling them. However, the bottom line of what I’ve been telling them is all about Discipline& Being Focused to their Goal! And impressed on them the mantra, “Train As You Race”! As these two runners are tapering for the running event and preparing for their departure to Hongkong in one week’s time, I would like to take this opportunity to thank the runners, local & international, who contributed financial support to these two runners and to Andre Blumberg of Hongkong who is the Principal Sponsor for our Pinoy Elite Runners to the 2013 Vibram Hongkong 100K Trail Run. Thank you very much! 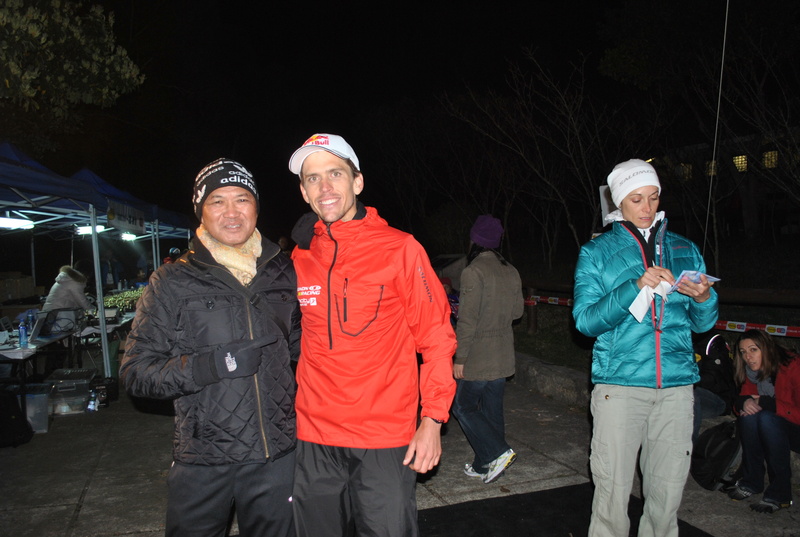 Ryan Sandes of South Africa finished the 2012 Vibram Hongkong 100K Trail Run in 9:54 hours beating the course record in almost 2 hours. He is the reigning Champion of the 2011 Leadville 100-Mile Endurance Trail Run with a finish time of 16:46:54 hours. (Note: At the background is his girlfriend/support crew, Vanessa Haywood, an actress and a model). 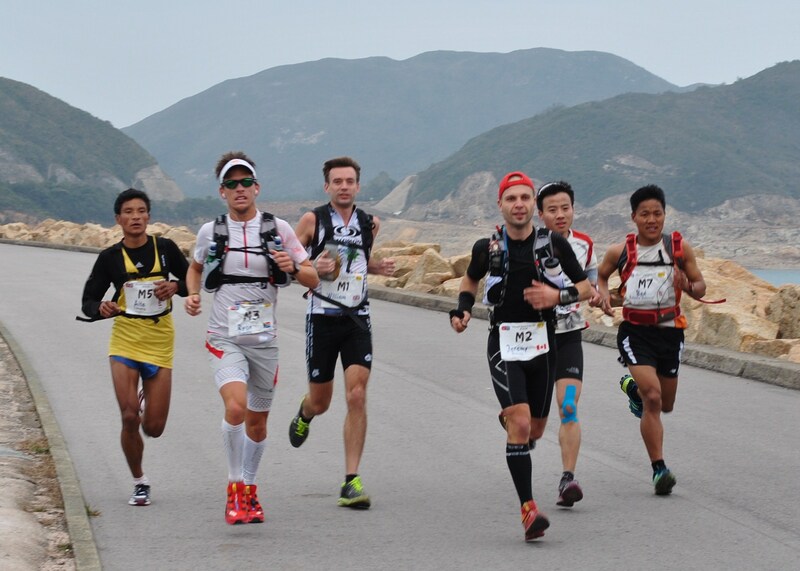 Two Nepalese soldiers-ultrarunners were 18 minutes behind him who finished 2nd and 3rd place! Ryan Sandes is a member of Team Salomon.